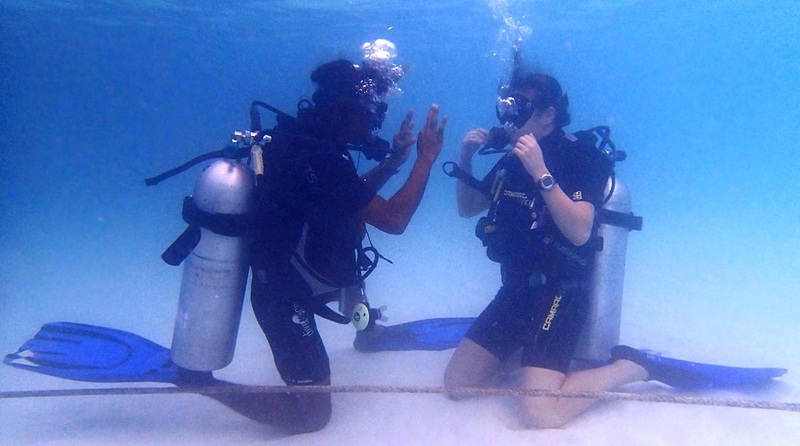 Scuba diving must be learned at a professional diving school. There are several chains of dive schools worldwide, and they all teach the same fundamentals. 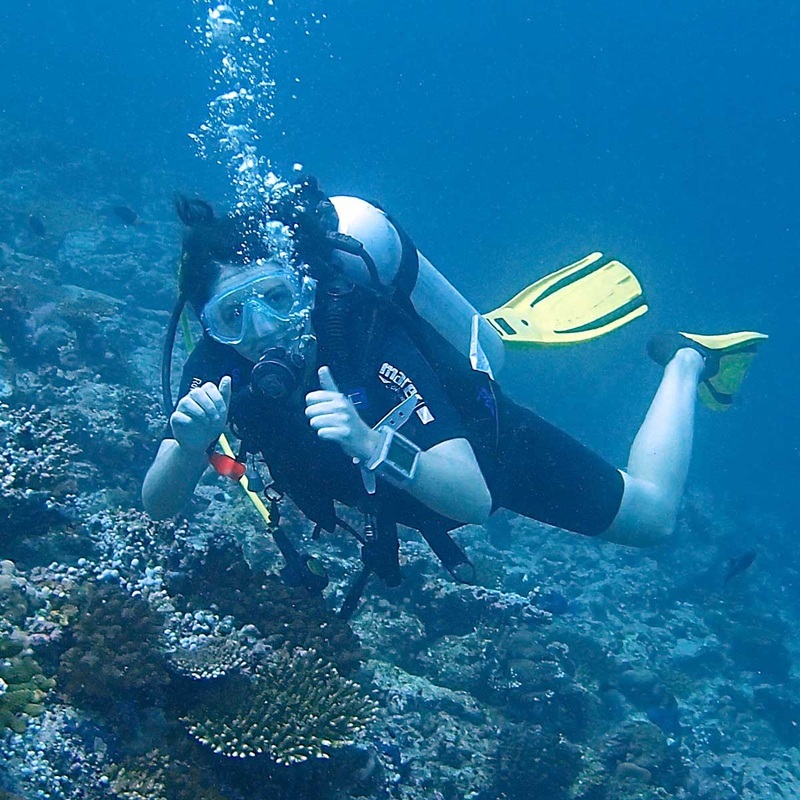 I followed a PADI “Open Water Diver” course. It consists of 5 lessons with various exercises in shallow water and 4 dives to 8-12 meters. Before each dive lesson do you study a manual, watch a video and answer some written questions. Then you practice what you have studied. You may also do the theory online before you start diving. 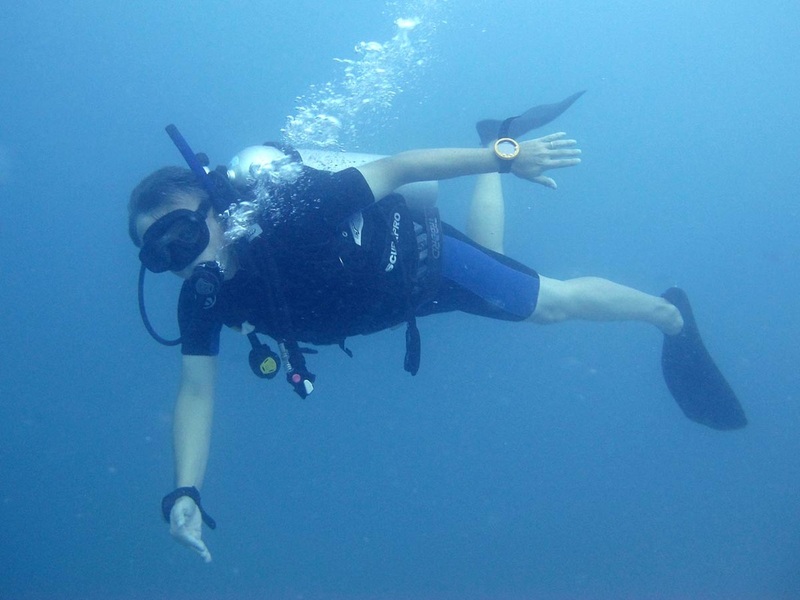 First, you learn how to dress into the dive gear and use it: Wet suit, air tank, BCD (a west that can be filled with air to to maintain neutral buoyancy), air regulator, belt with lead weights (typically 4-6 kg), mask, snorkel and fins. The first time does it feel weird, but after a few dives is it just right. Then you learn safety procedures, such as hand signals, what to do if the air tank gets empty, you lose the regulator or the mask is filled with water. It is in fact very easy to remove water from the mask: Bend your head upwards, press the top of the mask to your forehead with both hands and blow air out of your nose. This increases the pressure inside the mask, and the water will escape from the lower part of the mask. Water pressure increases linearly with depth. At the surface is it 1 atmosphere, at 10 meters is it 2 atmospheres, and at 20 meters is it 3 atmospheres and so on. This has some effects on your body. When you double the water pressure, the volume of your lungs and other organs filled with air/gas is reduced to half. Therefore must you equalize the pressure in your inner ear when you descend or ascend. This is done by squeezing the nostrils with your fingers and blow hard inside the mouth. As the pressure increases, the air consumption increases: When the pressure is doubled, your consumption is doubled. And down at 30 meters, where the pressure is 4 atmospheres, your air consumption 4 times higher that at the surface. Another effect is that when the volume of the lungs is reduced, you will have less buoyancy. That’s why we have BCD (Buoyancy Control Device). This is a vest with a bladder that can be filled with air from the tank. To stop sinking – add a little air. To stop ascending – release a little air. It also compensates for consumed air (the tank gets lighter). But the fine tuning of your buoyancy is done with your own lungs: Inhale – and you start to ascend. Exhale – and you start to descend. There’s a golden rule for divers: Never hold your breath. This is very important to avoid damage to the lungs when you are ascending, because the air in the lungs will expand as the water pressure is reducing. There may be times when you don’t notice that you are ascending. My first dives were chaotic, because I felt like I was tilting over to one of the sides and could not control my buoyancy. My arms waved everywhere, except for where they should be, and my kicks were terrible. Ayya, my patient instructor, made a video of me, and I keep it as a reminder not to laugh when I see other newborn scuba divers. When I received my diving licence I felt like a 1 year baby that had just learned to walk. So I started on the Advanced Open Water Diver course. It consists of 5 modules. The most useful module for me was “Peak Buoyancy”, which helped me to control my breath so I could stay at the depth I wanted to be at. This is an important skill when you take pictures of cute fish. As the number of dives started to accumulate, I started to relax more, and I could dive with less effort and less air consumption. 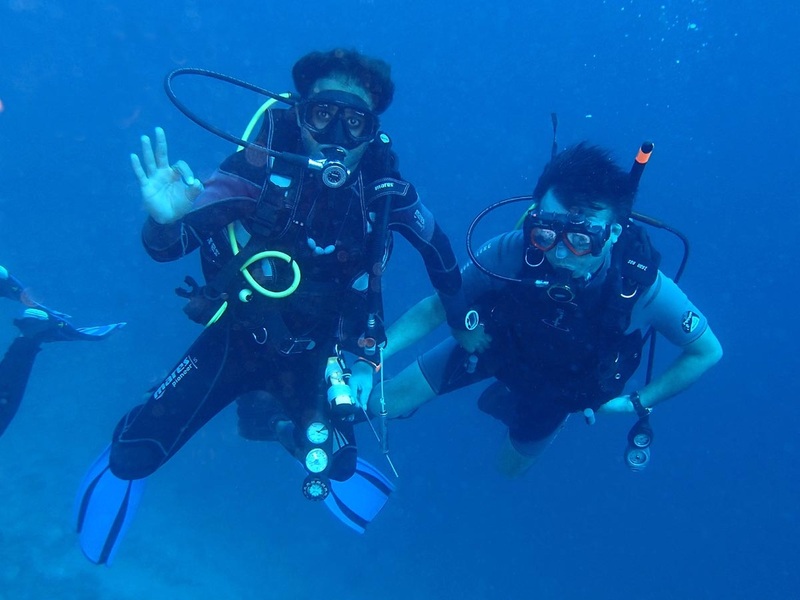 Diving is a great way to explore Maldives. It also let you meet other people who share the passion for this fascinating sport. 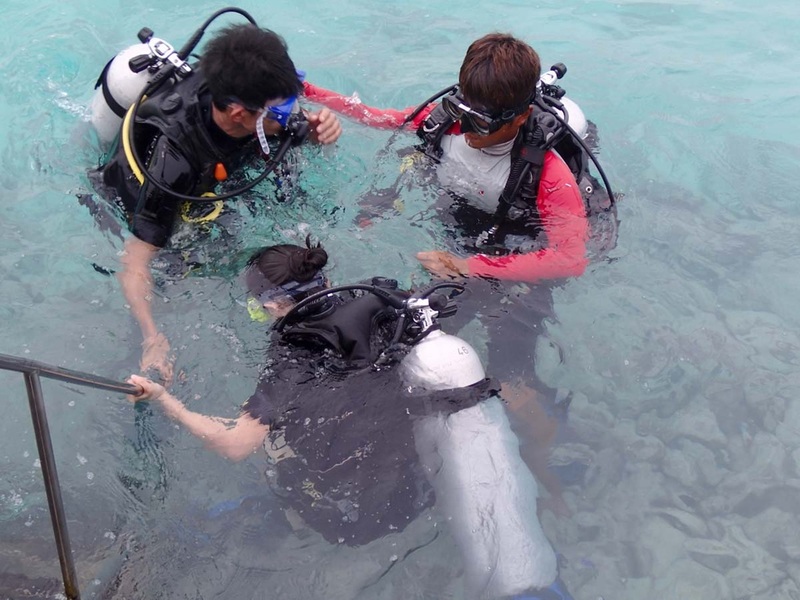 A dive instructor introduces two students to scuba diving. The first breath under water is an exiting experience. An instructor giving a lesson in shallow water. Exercises includes hand signals, what to do if the tank gets empty, you loose the regulator or the mask is filled with water. During the first dives do you stay close to your instructor. 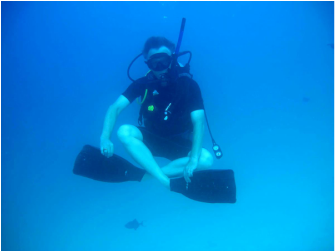 My first dives were a struggle to learn to relax: "My arms waved everywhere, except for where they should be..."
Practicing buoyancy control: Inhale, and you ascend. Exhale, and you descend.